But until now, it was impossible to show the same expression of personal style with your pickup truck. Well, we’ve listened to our customers and now you can get the legendary durability and precise fit of a DualLiner bed liner with new eye-catching camouflage graphics. Graphics can be added to any DualLiner which cover Full Size pick-up trucks from GM, Ford and Dodge 1999 to 2017. 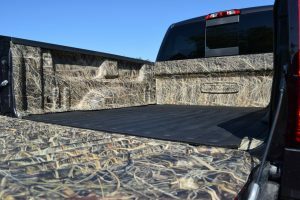 Now, your truck can stand out from the crowd instead of just blending in with a basic black bed liner! Of course, there already are options for tinted and colored spray-in liners for the truck owner who wants something more than traditional black in the back of their truck. But we all know about the problems with spray-in bed liners, and worst of all, it’s permanent so you’re stuck with the color you choose! But with the new DualLiner Camouflage Bed Liner you can give your truck the best bed protection available on the market along with a unique, photorealistic full-color camouflage pattern that is sure to turn heads! You can install it yourself in as little as 20 minutes in your own driveway without having to make an appointment or leave your truck with an installer. Plus, it’s easily removable for cleaning or to transfer to your next truck. We can even help you design a completely custom look with different colors, backgrounds and prints – with thousands of choices available to you, the only limit is your imagination! To read more about the specialized hydrographic water transfer process we use to apply real licensed camouflage patterns, head over to DualLiner.com/Camo. While you’re there you can learn about the tough, multi-step finish on every custom camouflage DualLiner that makes them incredibly resistant to weather, scuffs, and UV fading! I have a 1994 Chevrolet Silverado can you make tailgate bed liner & how much is the cost.